Alpine Mountaineering - with British Mountain Guides, UIAGM IFMGA Mountain Guides. 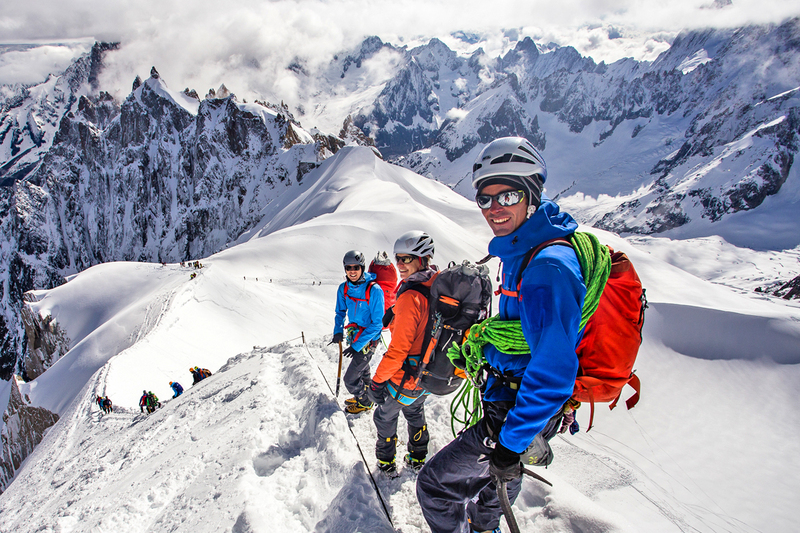 Alpine mountaineering is at the heart of the guide’s profession. Whether it’s glacier trekking, airy ridge traverses, long mountain rock routes or multi-day mixed climbs, this activity epitomises the work of British Mountain Guides. We have a history of travelling out from Britain for the summer season, so rather than being based in just one valley, we move around the alpine chain from Chamonix in the west to the Dolomites in the east. Many guides also now live all year round in the European Alps but we maintain the flexibility to move around, finding the route that’s right for our clients. When you engage a British Mountain Guide for your alpine experience, your guide will not just lead you to the summit and back, but also teach you the essential skills required to climb efficiently in the Alps. You can push the standard of routes you accomplish with your guide, or take those skills and use them independently. It’s a great pleasure for us to see clients we’ve taught going off to achieve their alpine goals for themselves. The alpine experience of climbing together, often for a full week and staying in mountain huts, develops friendships that last a lifetime. The personal relationship which is at the heart of the guided alpine experience is enhanced by your guide having the same language, cultural values and mountaineering background as you. Whether your goal is walking from Chamonix to Zermatt via the Haute Route, a course to improve your alpine skills, a week of technical alpinism or climbing Mont Blanc, choose a British Mountain Guide for your next alpine adventure. Discover remote summits, airy ridges and stunning vistas. Be guided through the Alps by guides with a passion for their vocation.